The Alvin Ailey American Dance Theater contracts are set to expire next week on May 31, so negotiations are down to the wire; meanwhile the company is preparing for performances at Lincoln Center June 13 to 17. Despite the unrest, anything involving this group is undeniably spirited and lively. 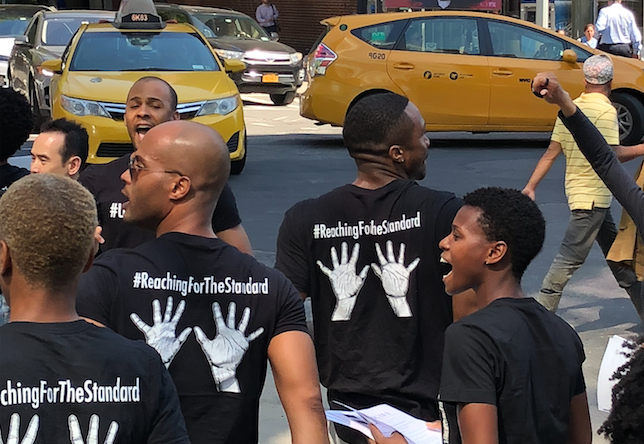 The 32 company members broke into call and response chants, dancing while passing out fliers and pins on the corner of 55th Street and 9th Avenue, in front the steps of their home—the Joan Weill Center for Dance. The dancers have refrained from making public statements over the past five months, but yesterday 10-year veteran Akua Noni Parker spoke on their behalf with positivity and clarity. The gathering's purpose was to increase visibility, and as AGMA national executive director Len Egert stated, to ask supporters to call Ailey's executive director Bennett Rink to encourage fair contracts for these beloved artists. The five highest earning workers in the Ailey organization make more than all 34 dancers and stage managers combined. AAADT is the fourth largest American dance company based on budget, but the dancers make 30-35% less than their colleagues in other companies. AAADT performs 175-200 times per year, more than any other major dance company in the United States. The company has one-third to half as many dancers of the other major companies (including New York City Ballet, American Ballet Theatre and San Francisco Ballet). "For sixty years, the mission of the Alvin Ailey Dance Foundation has been to further the pioneering vision of Mr. Ailey, who sought to promote community and the richness of African-American culture with dance, training and educational programs for all people. As a not-for-profit, the Ailey organization has a duty to ensure the long-term viability of the entire institution. Throughout the negotiations process, we have been committed to compromise and as we proceed in our conversations with AGMA, we hope the union takes its responsibility to negotiate in good faith as seriously as we do. In our ongoing negotiations with AGMA, we remain committed to reaching an agreement that is both fair and sustainable. Ailey dancers are among the best in modern dance. While they already have the best salaries and benefits of any modern dance company, we're committed to doing even more. We have been making unprecedented enhancements to our proposals on the union's highest priorities, the most recent of which was on Tuesday night. Ailey dancers and stage managers are vital parts of this multi-faceted organization. We look forward to reaching an agreement with their union and continuing to enhance Alvin Ailey's cherished legacy."